In 1966, China’s leader, Mao Ze-dong, announced the Chinese Cultural Revolution. In the previous years, the Chinese Communist Party worked to restore a divided nation, and promote equal resources for all its citizens. However, there were problems, and these problems grew much worse after the Revolution. Ji-Li turned twelve the year of the Cultural Revolution. Before it, she was an excellent student and her family was respected by the community. However, when Chairman Mao announces the need to get rid of the “Four Olds”, or the values of the past that undermine the communist ideal, things become dangerous for Ji-Li’s family. Rather than promoting equality, the leaders of the Revolution looked to persecute families that were wealthy in the past. Because Ji-Li’s grandfather had been a landlord, her family was considered to be traitors. Students at the school are encouraged to tell on each other, and houses are searched. Sometimes the leaders are violent. How can Ji-Li be loyal to her family and her country at the same time? 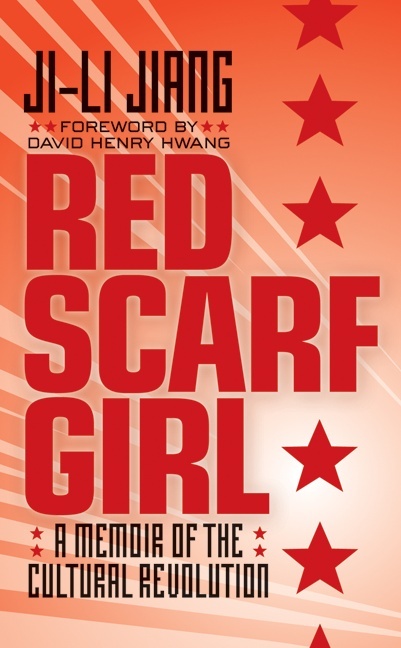 Red Scarf Girl is a memoir of Ji-Li Jiang’s experiences during the Cultural Revolution in China. I had never come across anything like this for young adults before, and was intrigued. There are many fictional and factual books covering both World Wars, the Holocaust, and other upheavals, but this is the first I’ve seen from Communist China. I was especially interested because it is true; I wanted to learn how the youth of China perceived the government and cultural ideals during this time. This book would be a valuable addition to a classroom library, especially with the included pronunciation guide, glossary, and epilogue. I loved reading the author’s explanation of her own feelings about the Revolution, and I think middle school readers would benefit from a solid account of an overlooked event in our history. Jiang, Ji-Li. Red Scarf Girl. New York: HarperTrophy, 1997. 285 pp. Ages 10-14. If you liked this book, you might want to check out Running the Rift by Naomi Benaron.